The center of gravity of Israel’s strategic challenge was always Egypt. The largest Arab country, with about 80 million people, Egypt could field the most substantial army. More to the point, Egypt could absorb casualties at a far higher rate than Israel. The danger that the Egyptian army posed was that it could close with the Israelis and engage in extended, high-intensity combat that would break the back of Israel Defense Forces by imposing a rate of attrition that Israel could not sustain. If Israel were to be simultaneously engaged with Syria, dividing its forces and its logistical capabilities, it could run out of troops long before Egypt, even if Egypt were absorbing far more casualties. The solution for the Israelis was to initiate combat at a time and place of their own choosing, preferably with surprise, as they did in 1956 and 1967. Failing that, as they did in 1973, the Israelis would be forced into a holding action they could not sustain and forced onto an offensive in which the risks of failure — and the possibility — would be substantial. It was to the great benefit of Israel that Egyptian forces were generally poorly commanded and trained and that Egyptian war-fighting doctrine, derived from Britain and the Soviet Union, was not suited to the battle problem Israel posed. In 1967, Israel won its most complete victory over Egypt, as well as Jordan and Syria. It appeared to the Israelis that the Arabs in general and Egyptians in particular were culturally incapable of mastering modern warfare. Thus it was an extraordinary shock when, just six years after their 1967 defeat, the Egyptians mounted a two-army assault across the Suez, coordinated with a simultaneous Syrian attack on the Golan Heights. Even more stunning than the assault was the operational security the Egyptians maintained and the degree of surprise they achieved. One of Israel’s fundamental assumptions was that Israeli intelligence would provide ample warning of an attack. And one of the fundamental assumptions of Israeli intelligence was that Egypt could not mount an attack while Israel maintained air superiority. Both assumptions were wrong. But the most important error was the assumption that Egypt could not, by itself, coordinate a massive and complex military operation. In the end, the Israelis defeated the Egyptians, but at the cost of the confidence they achieved in 1967 and a recognition that comfortable assumptions were impermissible in warfare in general and regarding Egypt in particular. The Egyptians had also learned lessons. The most important was that the existence of the state of Israel did not represent a challenge to Egypt’s national interest. 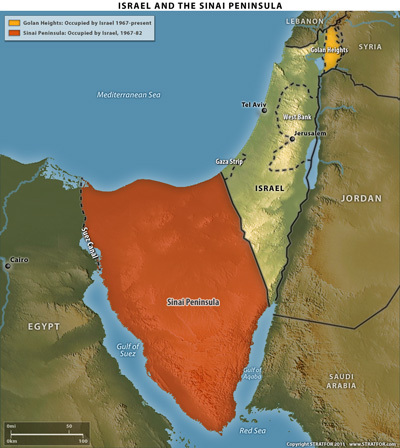 Israel existed across a fairly wide and inhospitable buffer zone — the Sinai Peninsula. The logistical problems involved in deploying a massive force to the east had resulted in three major defeats, while the single partial victory took place on much shorter lines of supply. Holding or taking the Sinai was difficult and possible only with a massive infusion of weapons and supplies from the outside, from the Soviet Union. This meant that Egypt was a hostage to Soviet interests. Egypt had a greater interest in breaking its dependency on the Soviets than in defeating Israel. It could do the former more readily than the latter. The Egyptian recognition that its interests in Israel were minimal and the Israeli recognition that eliminating the potential threat from Egypt guaranteed its national security have been the foundation of the regional balance since 1978. All other considerations — Syria, Hezbollah, Hamas and the rest — were trivial in comparison. Geography — the Sinai — made this strategic distancing possible. So did American aid to Egypt. The substitution of American weapons for Soviet ones in the years after the treaty achieved two things. First, they ended Egypt’s dependency on the Soviets. Second, they further guaranteed Israel’s security by creating an Egyptian army dependent on a steady flow of spare parts and contractors from the United States. Cut the flow and the Egyptian army would be crippled. The governments of Anwar Sadat and then Hosni Mubarak were content with this arrangement. The generation that came to power with Gamal Nasser had fought four wars with Israel and had little stomach for any more. They had proved themselves in October 1973 on the Suez and had no appetite to fight again or to send their sons to war. It is not that they created an oasis of prosperity in Egypt. But they no longer had to go to war every few years, and they were able, as military officers, to live good lives. What is now regarded as corruption was then regarded as just rewards for bleeding in four wars against the Israelis. But now is 33 years later, and the world has changed. The generation that fought is very old. Today’s Egyptian military trains with the Americans, and its officers pass through the American command and staff and war colleges. This generation has close ties to the United States, but not nearly as close ties to the British-trained generation that fought the Israelis or to Egypt’s former patrons, the Russians. Mubarak has locked the younger generation, in their fifties and sixties, out of senior command positions and away from the wealth his generation has accumulated. They want him out. For this younger generation, the idea of Gamal Mubarak being allowed to take over the presidency was the last straw. They wanted the elder Mubarak to leave not only because he had ambitions for his son but also because he didn’t want to leave after more than a quarter century of pressure. Mubarak wanted guarantees that, if he left, his possessions, in addition to his honor, would remain intact. If Gamal could not be president, then no one’s promise had value. So Mubarak locked himself into position. The cameras love demonstrations, but they are frequently not the real story. The demonstrators who wanted democracy are a real faction, but they don’t speak for the shopkeepers and peasants more interested in prosperity than wealth. Since Egypt is a Muslim country, the West freezes when anything happens, dreading the hand of Osama bin Laden. In Egypt, the Muslim Brotherhood was once a powerful force, and it might become one again someday, but right now it is a shadow of its former self. What is going on now is a struggle within the military, between generations, for the future of the Egyptian military and therefore the heart of the Egyptian regime. Mubarak will leave, the younger officers will emerge, the constitution will make some changes and life will continue. The Israelis will return to their complacency. They should not. The usual first warning of a heart attack is death. Among the fortunate, it is a mild coronary followed by a dramatic change of life style. The events in Egypt should be taken as a mild coronary and treated with great relief by Israel that it wasn’t worse. I have laid out the reasons the 1978 treaty is in Egypt’s national interest. I have left out two pieces. The first is ideology. The ideological tenor of the Middle East prior to 1978 was secular and socialist. Today it is increasingly Islamist. Egypt is not immune to this trend, even if the Muslim Brotherhood should not be seen as the embodiment of that threat. Second, military technology, skills and terrain have made Egypt a defensive power for the past 33 years. But military technology and skills can change, on both sides. Egyptian defensiveness is built on assumptions of Israeli military capability and interest. As Israeli ideology becomes more militant and as its capabilities grow, Egypt may be forced to reconsider its strategic posture. As new generations of officers arise, who have heard of war only from their grandfathers, the fear of war declines and the desire for glory grows. Combine that with ideology in Egypt and Israel and things change. They won’t change quickly — a generation of military transformation will be needed once regimes have changed and the decisions to prepare for war have been made — but they can change. Two things from this should strike the Israelis. The first is how badly they need peace with Egypt. It is easy to forget what things were like 40 years back, but it is important to remember that the prosperity of Israel today depends in part on the treaty with Egypt. Iran is a distant abstraction, with a notional bomb whose completion date keeps moving. Israel can fight many wars with Egypt and win. It need lose only one. The second lesson is that Israel should do everything possible to make certain that the transfer of power in Egypt is from Mubarak to the next generation of military officers and that these officers maintain their credibility in Egypt. Whether Israel likes it or not, there is an Islamist movement in Egypt. Whether the new generation controls that movement as the previous one did or whether they succumb to it is the existential question for Israel. If the treaty with Egypt is the foundation of Israel’s national security, it is logical that the Israelis should do everything possible to preserve it. This was not the fatal heart attack. It might not even have been more than indigestion. But recent events in Egypt point to a long-term problem with Israeli strategy. Given the strategic and ideological crosscurrents in Egypt, it is in Israel’s national interest to minimize the intensity of the ideological and make certain that Israel is not perceived as a threat. In Gaza, for example, Israel and Egypt may have shared a common interest in containing Hamas, and the next generation of Egyptian officers may share it as well. But what didn’t materialize in the streets this time could in the future: an Islamist rising. In that case, the Egyptian military might find it in its interest to preserve its power by accommodating the Islamists. At this point, Egypt becomes the problem and not part of the solution. Keeping Egypt from coming to this is the imperative of military dispassion. If the long-term center of gravity of Israel’s national security is at least the neutrality of Egypt, then doing everything to maintain that is a military requirement. That military requirement must be carried out by political means. That requires the recognition of priorities. The future of Gaza or the precise borders of a Palestinian state are trivial compared to preserving the treaty with Egypt. If it is found that a particular political strategy undermines the strategic requirement, then that political strategy must be sacrificed. In other words, the worst-case scenario for Israel would be a return to the pre-1978 relationship with Egypt without a settlement with the Palestinians. That would open the door for a potential two-front war with an intifada in the middle. To avoid that, the ideological pressure on Egypt must be eased, and that means a settlement with the Palestinians on less-than-optimal terms. The alternative is to stay the current course and let Israel take its chances. The question is where the greater safety lies. Israel has assumed that it lies with confrontation with the Palestinians. That’s true only if Egypt stays neutral. If the pressure on the Palestinians destabilizes Egypt, it is not the most prudent course. There are those in Israel who would argue that any release in pressure on the Palestinians will be met with rejection. If that is true, then, in my view, that is catastrophic news for Israel. In due course, ideological shifts and recalculations of Israeli intentions will cause a change in Egyptian policy. This will take several decades to turn into effective military force, and the first conflicts may well end in Israeli victory. But, as I have said before, it must always be remembered that no matter how many times Israel wins, it need only lose once to be annihilated. To some it means that Israel should remain as strong as possible. To me it means that Israel should avoid rolling the dice too often, regardless of how strong it thinks it is. The Mubarak affair might open a strategic reconsideration of the Israeli position. 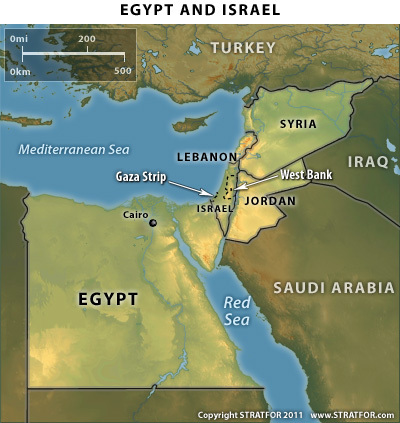 Egypt, Israel and a Strategic Reconsideration is republished with permission of STRATFOR.